The chapter synthesizes findings from diverse disciplinary perspectives to make the case that we need a new lens to better serve the diversity of bilingual learners. Drawing upon theories and findings from studies by educators, child developmentalists, and neuroscientists, but moving beyond any one disciplinary perspective, the authors aim to create a unity of new knowledge developed of theories from across disciplines. This approach is exactly what is needed to address the complexity of factors surrounding bilingual learners. Taking a transdisciplinary approach will allow us to move closer toward an understanding of the many factors affecting bilingual children and families, and this new knowledge can be applied to promote their educational and lifelong success. Many years ago, as an undergraduate student, I had the privilege of enrolling in an academic internship course. Though I was studying psychology, I chose to intern at a Head Start preschool, which eventuated in my becoming a co-teacher. I began my experience in the classroom because of my desire to teach young children, but quickly realized that I was the true learner in this experience. Of the 20 young children, five spoke mostly Spanish, and they quickly piqued my intellectual interests. One of the young boys, Eddie, was quite the classroom wanderer. He just never sat still! He seemed to enjoy every area of teaching space, even the dramatic play section, mostly inhabited by the girls, and would “disrupt” circle time if he happened to find it more interesting to take up a paint brush. With great curiosity, I watched him one day carefully wrap a doll in a baby blanket, balance his baby in one arm, while pretending to phone his invisible wife, presumably away at work. He was clearly mimicking his own father, an involved family man whom I often talked with during drop-off or pick-up times. This observation was only one of many that I had that caused me to reflect on this young boys’ familismo (high value of family; loyalty, reciprocity, and solidarity with family; Gonzales, Germán, & Fabrett, 2012) and other positive cultural characteristics of Mexican American families that can easily go unnoticed in our school systems. Eddie, an emerging Spanish-English bilingual, held incredible assets of linguistic and cultural wealth, as do many young children in immigrant families. 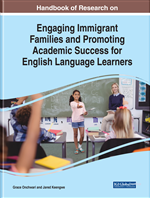 Bilingual learners, also are referred to in research studies and by the U.S. Department of Education National Center for Education Statistics (NCES, 2018) as English Language Learners (ELLs) or children with Limited-English-Proficiency (LEP), have many unique strengths that they bring to the classroom. The present chapter focuses on these assets and the term bilingual learner is used throughout to a) emphasize that bilingual learners are doing much more than just learning English-- they are simultaneously developing a second language, subject area knowledge, and thinking skills; and b) highlight bilingual learners' accomplishments rather than deficits. It is only when we broaden our views that we learn to see how the many sociocultural facets of a child’s life are resources that shape the course of their development. In fact, to truly understand the ways in which we can work together to create positive pathways, it may be necessary to add new lenses, transcending any one vantage point, to understand the many layers that affect educational outcomes of diverse learners. Taking a transdisciplinary approach is quite different from simply merging two or more interdisciplinary approaches, which can sometimes fail to identify important differences in value and epistemology. Transdisciplinary approaches move from a problem outward without interest in concretizing any one discipline’s value system, theory, or research perspective, but rather creating a unity of new knowledge developed of theories from across disciplines. This approach is exactly what is needed to address the complexity of factors surrounding bilingual learners. By aggregating findings from studies by educators, child developmentalists, and neuroscientists, we move closer toward an understanding of the many predictors of bilingual children’s development, which can be used to ensure their lifelong and educational success. The present chapter synthesizes findings from diverse disciplinary perspectives to make the case that we need a new lens to better serve the diversity of bilingual learners. Contemporary theories from developmental science describe the interplay of biological, sociocultural, ecological, and historical factors on development (e.g., Baltes, Lindenberger, & Staudinger, 2006; Lerner, 2006). From developmental science, we learn that to fully understand any aspect of development, it is important to view the individual from a holistic perspective, investigating not only multiple predictors of developmental outcomes, but also the many ways that these predictors interact to produce the outcomes. It also is critical to consider the diversity of bilingual learners from those who are challenged by learning disabilities to those who are gifted and talented, and even those who may be a combination of both. Neural Plasticity (Neuroplasticity): The brain's ability to change at any age. Some changes that occur include the shrinking or thickening of grey matter and the forging or weakening of neural connections. Gifted and Talented Education/Program: A broad term for special practices, procedures, and theories used in the education of children who have been identified as gifted and/or talented. English as a Second Language learner (ESL): Learners who are not native English speakers. Learning Disability (Specific Learning Disability): A broadly applied term that covers a range of neurologically based disorders in learning related to basic psychological processes: (1) input (auditory and visual perception), (2) integration (sequencing, abstraction, and organization), (3) memory (working, short term, and long term memory), (4) output (expressive language), and (5) motor (fine and gross motor). Dyslexia: A language-based learning disability that can affect an individual’s speaking, reading, and/or writing abilities, including the ability to recall information. Transdisciplinary Approach: A research effort conducted by investigators from different disciplines working jointly to create new conceptual, theoretical, methodological, and translational innovations that integrate and move beyond discipline-specific approaches to address common problems. Emergent Bilingual: Learners who are in the developing stages of acquiring their native language (L1) and/or a second language (L2), and who have the ability to tap into both languages as resources. This term is used as a way to reject the deficit-oriented terminology of limited English proficient (LEP), English language learner (ELL), English learners (EL) or English as a second language (ESL) students. Dual Language Education Program: An enriching form of bilingual education in which students are taught literacy and content knowledge in two languages. Phenotype: The observable traits of an individual resulting from the interaction of its genotype with the environment. English Language Learner (ELL): Learners with a limited proficiency in English. Giftedness: The extent to which an individual has an ability that is significantly above the norm for their age; may manifest in one or more domains such as; intellectual, creative, artistic, leadership, or in a specific academic field such as language arts, mathematics or science. Critical (Sensitive) Period: A time in the lifespan during which the nervous system is especially sensitive to environmental stimuli. Limited English Proficiency (LEP): Individuals who have a limited ability to read, speak, write, or understand English. Limbic System: Interactive brain areas that comprise a neural network that is involved in the regulation and expression of emotions and emotional behaviors. Genotype: The genetic make-up of an individual. Molecular Genetics: The field of biology that studies the structure and function of genes at a molecular level. The study of chromosomes and gene expression of an organism provides insight into heredity, genetic variation, and mutations.